Senior forward Kate Allen’s home career ended with a pair of losses, one to Michigan State and one to Michigan. Allen, whose 21 career goals are third in program history, was one of seven seniors honored in a pregame ceremony Sunday. Northwestern finished its season at Lakeside Field in familiar fashion — walking off the field in defeat. The Wildcats (3-13-2, 1-9-0 Big Ten) played their final two home games this weekend against Michigan State (9-7-2, 3-7-0) and No. 10 Michigan (14-2-1, 8-1-1), sending off the seniors with a heartwarming ceremony before the latter. 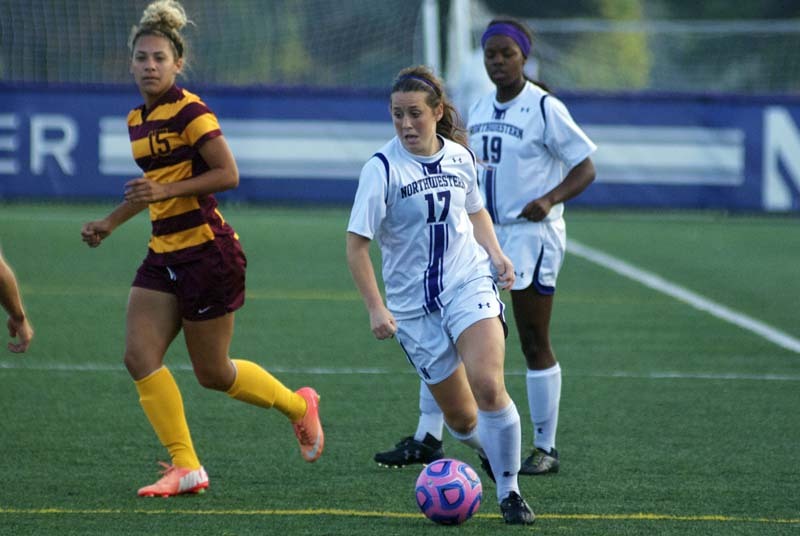 First, NU endured a difficult loss to the Spartans on Friday night. “After playing as well as we did with as much energy as we did, it was just hard to believe that we couldn’t get a result in that game,” Moynihan said. The Cats outplayed the Spartans all game long, dominating time of possession and taking 22 shots, 14 on goal, as opposed to Michigan State’s nine shots. There was only one problem — a problem NU has suffered all season long — scoring goals. Filled with energy, the Cats came out firing early and acquired a quick 1-0 lead when sophomore midfielder Margo McGinty earned her first career goal. McGinty knocked the ball over the head of Michigan State goalkeeper Gabrielle Gauruder off the assist from junior midfielder Georgia Waddle at the 14 minute mark. “It feels good after putting a bunch over the crossbar to finally get one in,” McGinty said. Michigan State, however, wouldn’t go down without a fight, sending it to the half tied 1-1 after midfielder Kirsten Evans sent one high past NU junior goalie Ali Herman with 12 minutes left in the half. The Cats continued to control play throughout the second half but missed a slew of opportunities, ultimately culminating in a Michigan State goal by Rachel Van Poppelen 83 minutes into the game to give the Spartans a 2-1 victory. “That was a really hard result because that effectively eliminated us from the Big Ten tournament,” Moynihan said. Despite the loss, which Moynihan also attributed to poor officiating, the coach was incredibly proud of the team’s play in this game and loved the energy it showed. After losing the weekend’s first game, the Cats had one last opportunity to give their seniors a final victory in Evanston on Sunday against Michigan. NU, however, was unable to pull off the upset and was only able to offer the seniors a celebratory pregame ceremony. Compared with Michigan State when the Cats took charge, taking 22 shots, NU had a far more defensive approach versus Michigan, taking only five. Senior goalie Sam Hatfield, in her first start of the season, had a career-high seven saves. The Cats played tight defense and allowed only one goal in the first half to Cassie Collins, who gave the Wolverines a lead three minutes before halftime which they would never lose. NU continued to battle in the second half, but ultimately allowed goals to Meghan Toohey on a penalty kick after a Cats hand ball and to Nicky Waldeck. Although this season is coming to a close, Moynihan views this as merely the beginning.